Each episode of Amazing Interiors (2018), features three properties and their proud creators/owners/inhabitants, who guide the camera crew around the buildings, showing off the greatest features and most expensive additions to their designs. The homeowners selected for this Netflix Original documentary series have filled their personal spaces with their artistic visions and unique ideas, and here they offer a tour to Netflix subscribers, like a Joe Millionaire’s version of Cribs. Several couples are followed through the construction processes of their new homes – for instance the London boat refurbishment in Episode 1, and the 1970’s-styled penthouse renovation in the 4th Episode – while we are also frequently exposed to the notion of the “man cave”. Primarily featuring men, the series is littered with various forms of “man caves” of both the indoor and outdoor variety (see Episode 7 for a back garden homemade roller-coaster..), and the prominence of this concept of a man claiming a section of the home is clear from the many car and sports enthusiasts. These, interspersed with the occasional couple or pink-loving young woman, suggest a slightly unbalanced gender representation throughout the 12 half-hour installments. The gender inequality here is literally visible from the number of wives interviewed about their husbands’ immense design projects. While they may be supportive of their spouses’ renovations, it is clear they have to put up with a lot in the process, having little to no say in the evolution of their homes, not to mention the space, time, and money consumed by their partners’ creative visions. Another idea which the series champions is ‘out with the new and in with the old’, in contrast with the classic idiom, and made clear from the vintage inspirations and the recycling of various items for the final designs. Through up-cycling, the homeowners frequently cut down considerable costs, while significantly reducing their carbon footprints. 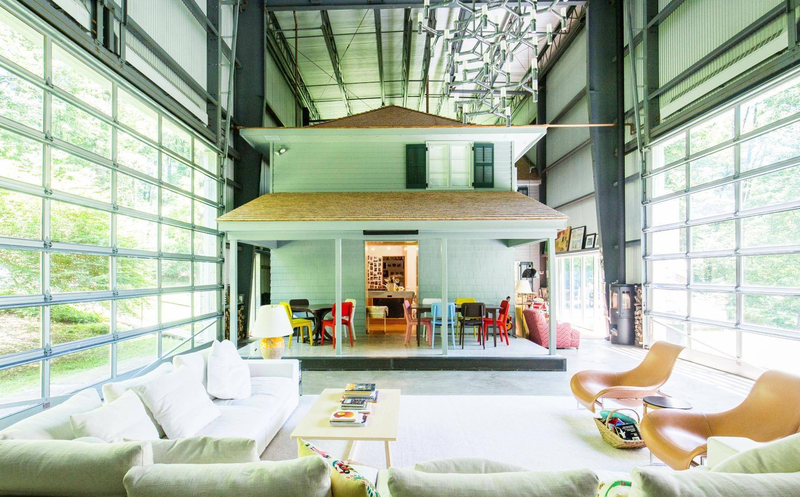 Whether it be re-holstering chairs, turning a giant shell into a tap, or refurbishing an old farmhouse inside an aircraft hangar (see Episode 7 for this architect’s dream), these Joe Millionaires seem do it all. While showing the design enthusiast viewers a cheaper alternative to buying brand new furniture, up-cycling older pieces is also in-keeping with current environmentally conscious trends. To be eco-friendly in designing homes, some even opted for shipping containers, school gymnasium flooring, and second-hand furniture. In doing so, the documentary celebrates an upper-class variety of green consciousness, while praising the artistry and creativity that has gone into many of the featured designs. This is an interior design docu-series that will visually amaze, whether that be through garish living spaces, creative innovations, or the thoughtful restructuring, and that entirely depends upon your own particular taste.